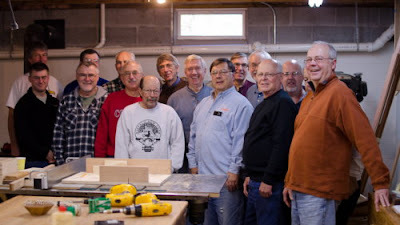 I just returned home from a two day box making class this weekend with Sawdust and Woodchips, a woodworking club in Syracuse, New York. I missed all the snow from the surprise Northeaster, and made it safely back to Arkansas last night. A few photos from the class are shown below. Woodworking clubs like Sawdust and Woodchips do important things in our communities. First, they provide social connection in which skills are shared and each member is encouraged in his or her growth. Secondly, most clubs with which I'm familiar, have programs designed to directly benefit their communities. 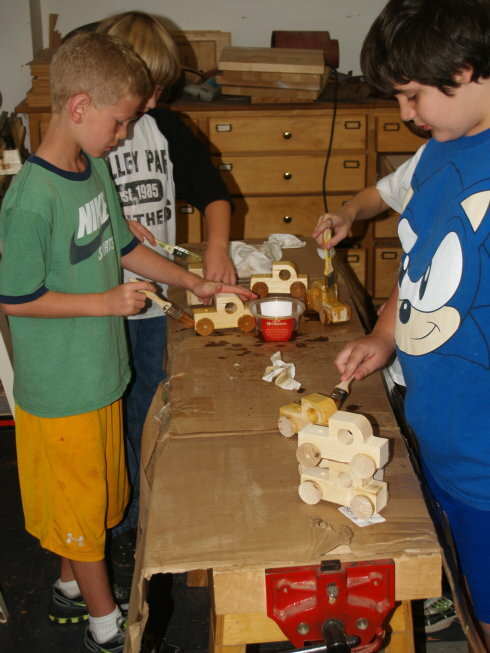 Sawdust and Woodchips has an annual toy making project that supplies toys to poor children and has raised money for the children's hospital. The club recently demonstrated at the New York State Fair, giving thousands of fair visitors a sense of how things were once made, and a glimpse of the wonderful tradition of woodworking. Many of the club members are involved in using local woods, and that, as you know, helps others to have a better appreciation of our natural environment. This next week Sawdust and Woodchips will have their annual show in which members will bring their best work to share with each other and compete for prizes. Woodworking clubs members are notorious for sharing interesting techniques with each other, sharing sources for tools and materials, and are given special discount buying privileges from a variety of woodworking suppliers. Some woodworking clubs bring in guest demonstrators and teachers for extended learning opportunities. If you are in the Syracuse New York area, check out Sawdust and Woodchips. If you are not, look for a woodworking club in your area. No two clubs will be exactly alike. Each will have activities designed to reflect the interest of its members. 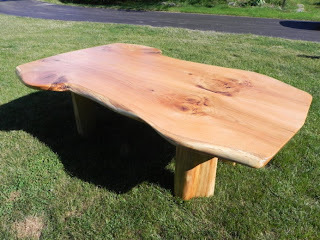 But, in most woodworking clubs you will find like-minded folks, who understand the value of hands-on learning, who are sincerely interested in building better communities and love wood. These are my kind of folks. 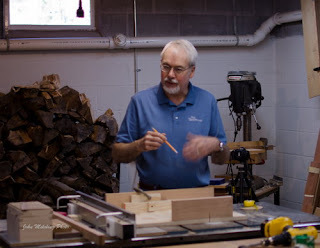 I want to publicly thank Bob Casey for arranging my class, and Barbara Raymond and Charlie LaPrease for their hospitality and for the use of their work shop and tools during great weekend of box making. Today, being back in the shop and off for fall break from Clear Spring School, I get to make boxes. My thanks to John Meloling for the photos of the class. Some of my readers may be interested in the Luddites and the Luddite falacy The Luddites rose up in opposition to the machine age as skilled workers were pushed out of employment. The "luddite falacy" claims that they were mistaken, though more modern observers have noted that the Luddites may have just been a couple hundred years ahead of their time in the same way that Malthusian Theory may have also been just a couple hundred years ahead of its time. To create a society of craftsmen, however is independent of what our machines may or may not do. It simply requires that we begin to recognize and place value in what people do in their own personal efforts to create useful beauty. In other words, we can have our computers and our saws and hammers, too. So, what would a society of craftsmen look like? That might be impossible for some to imagine. But in my own case, I've already had the privilege of living in one. 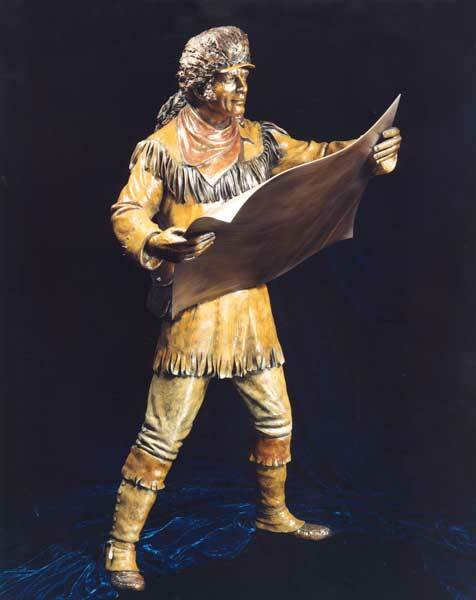 When I moved to Eureka Springs in 1975, we were already a community known for the arts. Our beautiful small town had become listed on the National Register of Historic Places (1970), largely as a result of the unflagging efforts of Louis Freund, a local artist who for years had keep telling the businessmen of the community that we were a very special place that deserved recognition. It was a rather tough battle because it required the establishment of a governing body (The Historic District Commission) to make sure the values of historic preservation were enforced. Louis suggested that the city should care for what it has, protect it, and promote it. And so we became a place that remains beautiful, where craftsmen can find work restoring and maintaining old Victorian homes and that is visited by millions of tourists each year. By the time I arrived here there were already a number of potters, painters, writers, musicians who had come first to make new lives for themselves within a strong, growing community. We gave encouragement to each other, and I found work making display cabinets for downtown galleries and shops, and furniture for a small number of local clients. Art and crafts do not happen merely in a vacuum, but require the sustenance of patrons, and the encouragement of of a creative environment. In 1976 I had called a meeting of artists to explore the notion of creating a guild for arts and crafts. Amazingly, about 30 showed up to a meeting on the shore of Lake Leatherwood, in a city owned park. Since I was the only one present with a clip board, paper and pen, I was proclaimed the first president of the Eureka Springs Guild of Artists and Craftspeople, a position I held for the first 6 months of the organization and then then much later for a time after the organization had matured. Of course the story goes on and on over the next 35+ years, with each artist adding significantly to what it means to live within a society of craftsmen. Today I leave for Syracuse to teach at Sawdust and Woodchips. 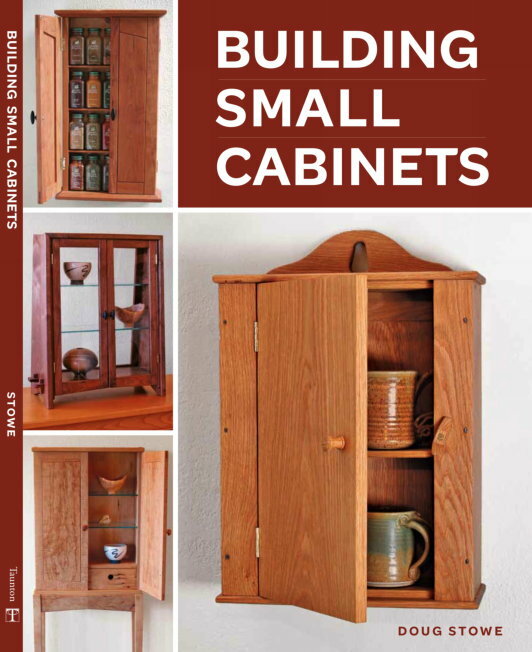 Yesterday I received my first copy of my new book Building Small Cabinets. 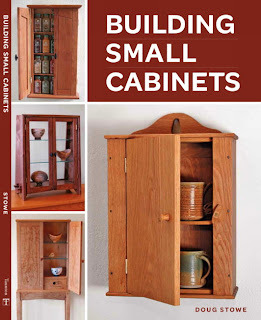 It will be available through Amazon.com, from FineWoodworking.com and your local bookstore. A society that understands the value of craftsmanship would be far different from what we have now. Otto Salomon had said that: “The objects that the child makes are as useful as those made by the carpenter; but, unlike the work of the carpenter, the value of the child’s work does not exist in them, but in the child that made them.” Over two hundred years earlier John Amos Comenius had quoted an old proverb as follows: "We give form to ourselves and to our materials at the same time." A young man or woman standing at a lathe gives shape, not just to to the wood but to him or herself. And what we see in these simple observations is that in the making of useful beauty, more happens than meets the eye. As we turn our attention toward beauty in the service of others, it is we ourselves who are transformed. Reader John Grossbohlin sent an article from the Wall Street Journal, Why Companies Aren't Getting the Employees They Need from October 24. Employers are quick to lay blame. Schools aren't giving kids the right kind of training. The government isn't letting in enough high-skill immigrants. The list goes on and on. But I believe that the real culprits are the employers themselves. candidates than ever before. They want prospective workers to be able to fill a role right away, without any training or ramp-up time. Bad for Companies, Bad for Economy In other words, to get a job, you have to have that job already. It's a Catch-22 situation for workers—and it's hurting companies and the economy. We have become reluctant to invest in each other. It seems we would rather buy cheap stuff from foreign lands made with little human skill and less attention, than to empower the growth of those around us. So the rich choose to live in gated communities so as not to be exposed to the society they have created by neglecting those who could instead have been challenged to arise to the highest of human form through engagement in the creative arts. We have bankers walking the streets of our largest cities who have no sense of the craftsmanship involved in the creation of the buildings they occupy and take for granted. We have great universities built using skills that none of their students in the contemporary era can appreciate or understand. Yale is an example. In contrast I am reminded of Pauline Agazzis Shaw who as a young mother became interested in Kindergarten and started sixteen of them in the city of Boston, knowing that it was not enough to offer advantages to her own children without building the whole of the culture in which they would live. She is also known as the founder of the North Bennet St. Industrial School and the woman who founded the Sloyd training school in Boston. I cannot tell you how to get there from here, but we need to develop a sense of the value of craftsmanship while the whole of our culture is aimed toward ease of use rather than the challenge of arising to accomplish difficult and demanding things. We have whole generations of Americans who have not developed enough skill to understand the gifts that craftsmanship can offer toward the development of both individual and culture. A society of craftsmen would know that challenging our children to arise to their best would build whole communities as each child arose to fulfill roles in life that expressed great character, concern for each other and for the nation and planet. an interesting thing is happening in relation to our current recession. Americans are staying put. according to this article in the Huffington Post. WASHINGTON -- Americans are staying put more than at any time since World War II, as the housing bust and unemployment keep young adults at home and thwart older Americans' plans for a beachfront or lakeside retirement. New information from the Census Bureau is the latest indicator of economic trouble, after earlier signs that mobility was back on the upswing. It's also a shift from America's long-standing cultural image of ever-changing frontiers, dating to the westward migration of the 1800s and more recently in the spreading out of whites, blacks and Hispanics in the Sun Belt's housing boom. That bodes well for the creation of a sense of community. Perhaps people will begin once again to find value in establishing deep roots within their communities, become craftsmen of their own lives. Today I had the first, second and third grade students in the CSS woodshop finishing their abacuses and preparing for their harvest party. This year, one of the events they will manage will be a woodworking booth where they can instruct other students in making tops. So we have lots of parts to prepare. And I have lots of work to do as well. 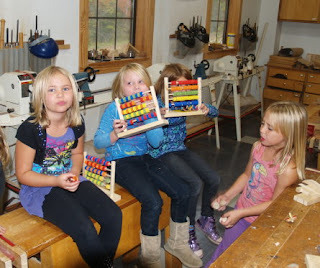 I will miss the harvest party this year, as I will be in Syracuse, New York to teach box making with the Sawdust and Woodchips Woodworking Club. I am getting things ready to leave on Friday. So much is learned in our culture with so little consequence. We go online and can explore for hours, having little or no effect on what we actually do. We can be chained to our devices, learn lots that is useless to us and be left unchanged. Idle curiosity seems to be the name of the age. But with real tools and real materials through which we might respond to what we have learned, we have unprecedented opportunity to be creative. Take away the real tools, however, and we are just idly entertained, regardless the level of our curiosity. My 7th, 8th and 9th grade students resumed cutting dovetails yesterday after a short break. The use of tools also requires attention to their own bodies, and real wood does not allow you to just start over again as one would in the manipulation of digital devices. The iPad doesn't care if you are sitting at a desk or standing on your head, and so your own physical nature is not a consideration in your lessons. But to saw along a straight line involves senses that our children do not commonly exercise. Without the development of these senses, our children are limited in power, just as the blind may not see, or as the deaf may not hear. On the subject of idle curiosity, you might enjoy reading about Thorstein Veblen, American economist and sociologist. Veblen is also interesting reading if you are at all concerned about malfeasance on Wall Street and the growing gap between rich and poor. "Hope and enthusiasm are soaring here. But not test scores. To be sure, test scores can go up or down for many reasons. But to many education experts, something is not adding up — here and across the country. In a nutshell: schools are spending billions on technology, even as they cut budgets and lay off teachers, with little proof that this approach is improving basic learning." I highly approve of technology in the classroom. Appropriate technology, that is. Rudolf Steiner, creator of the Waldorf Educational method maintained that children should only be introduced to technologies that they are at a level of learning to understand. If any of my readers can help me to find the exact wording and source of this quote, I would appreciate hearing from you. A new study reveals that 40% of 2-4 year old kids have regular exposure to smart phones, iPads and other high tech digital devices. It seems to be accepted by most parents that the use of real tools to learn to do real things is no longer required. A description of the study can be found here: Common Sense Media Research Documents Media Use Among Infants, Toddlers, and Young Children--Proliferation of digital media use among the very youngIt is proven that the amount of screen time is directly related to a variety of developmental problems in kids, but damn the torpedoes. We no longer seem to care about kids. Despite the proliferation of new technologies and platforms, television continues to dominate children's media use. Among all 0- to 8-year-olds, an average of 1:40 is spent watching television or DVDs in a typical day. Even among infants and toddlers, screen media use dwarfs time spent reading. In a typical day, 0- to 1-year-olds spend more than twice as much time watching television and DVDs (53 minutes) as they do reading or being read to (23 minutes). "Much of the focus in recent years has been on the explosion of media use among teenagers, whereas our study examines media use among young children during crucial developmental years," said James Steyer, CEO and founder, Common Sense Media. "Last week, the American Academy of Pediatrics reaffirmed their position that children under age 2 should not engage in any screen time, yet the data shows infants and toddlers are growing up surrounded by screens. This use data is an important first stop toward understanding how the prevalence of media and technology affects the development of our youngest kids." One of the many developmental problems researchers have noted is poor development of vocabulary by young media users. It seems that vocabulary is best developed through conversation with real people. Another problem noted by researchers is that children who have little free unstructured time away from digital media lack real problem solving skills. We are developing a generation of children easily entertained, but with little real world competence. That is a very sad thing to do to ourselves and our children. Hammers anyone? "Können ist besser denn Wissen." It is better to be able than to simply know. "The continuous still sitting, and the teaching of subjects which neither attract nor hold the child's attention, are the reasons why no real desire for knowledge is engendered; and when the children work with eagerness and apparent pleasure, it is generally due to other means than an interest in the subject itself. The present instruction neither corresponds with what the true aim of the public school should be, nor with the laws that directly relate to the nature of the child." Karl Friedrich was the nom de plume of Professor Friedrich Karl Biederman who had been involved in political strife in 1848 and thus chose not to publish his ideas on education under his own name until 1882. Today in my wood shop, I continue making small wooden boxes. 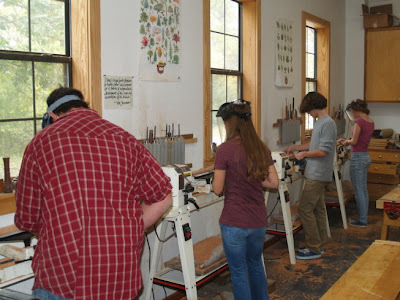 At the Clear Spring School wood shop this afternoon, students will be doing wood turning and cutting dovetails. J. H. G. Heusinger, in Germany wrote a pamphlet in 1797 which could be translated "How to Make Use of the Child's Active Impulse to Be Occupied"... His works were carefully studied by Froebel and then by Otto Salomon in the development of educational Sloyd. "From the sixth year on, the children are taught from books. Is it at all surprising that they think that it is from books alone that knowledge is to be obtained? A bright child has therefore no other desire than to get books and to study out of them. The acquisition of knowledge by his own observation by his own efforts is something that our present education does not teach him. This is left for after school hours, because it is still believed that the teaching of facts should be the main feature of all educational systems." Heusinger believed that "manual work should be a principal means of education as it satisfies the child's natural desire for creating and imitating." The following is from Duke Peter of Oldenburg, 1796... "he who is free must understand how to use his liberty, how to busy the mind and employ the hands." Dr. Conrad Michelson wrote the following about the good influence of a working school... "I recall one instance of a father who had been an habitual drunkard, and who worked only when urgent necessity drove him to it. His son had joined one of these working schools and busied himself evenings by doing some little manual work. One evening the father became interested in the son's work, and it was not a long time after this that he was encouraged to take a hand in it. He has since become thrifty and useful." 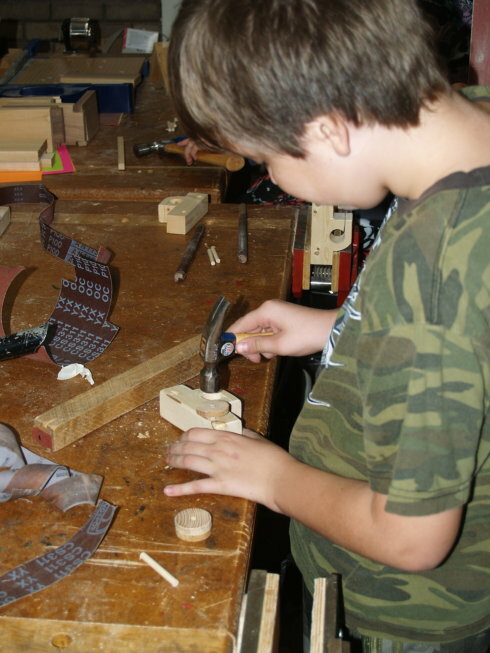 Today in the CSS woodshop, the 4th 5th and 6th grade students began making Civil War style checker sets. 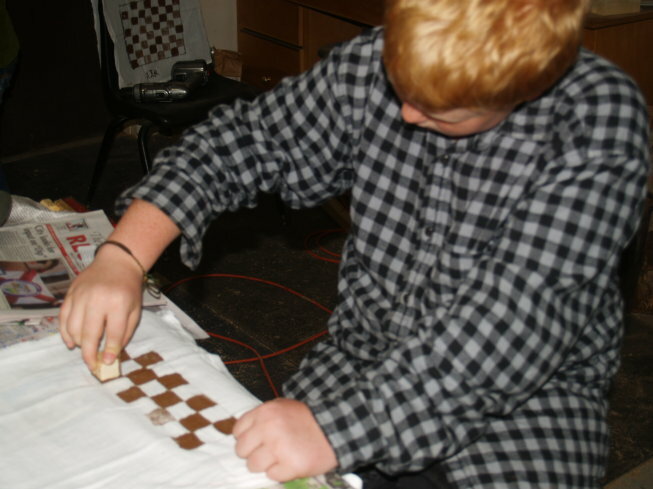 We did block printing of the checker boards, and cut the checkers from octagonal stock using hand saws. The printed fabric will be sewn to make a carrying pouch for their checkers. Our society is so fixated on appearances, and so much is missed if we allow ourselves to become judges of others based alone on what we see. I am in Nebraska for my sister's wedding and have been remembering my days working in my father's hardware store. One our our regular customers was a blacksmith. Another operated a salvage yard. The blacksmith, you can imagine, and the operator of the auto salvage yard? You can imagine that as well. Others in the small Nebraska town called him, dirty Louis, but a kinder man could not be found. One of the great shames of society is that we judge others on appearances alone. There is a tragic divide between those who are willing to become soiled in service to humanity, and those who will not. So be damned what they think of how things may appear. Is there sawdust on your lapel? Wear it with a sense of honor. It is emblematic of courage in the face of falsely presumed ingnominy. From whatever point of view one considers the different conditions of apprenticeship, they do not correspond with the needs of youth. The want of forethought in the parents, the indifference of the master, the impotence of the law, all betray the education of the apprentice. The development of commercial competition and progress in industrial technique are turned to his disadvantage... It will be generally admitted that the workshop, which ought to develop all the powers of the boy, wears out his body before nature has completed its development in form and power; blunts the intelligence which the school has tried to awaken; shrivels up his heart and imagination, and destroys his spirit of work. Deplorable school of private morals! It robs the man in the apprentice, the citizen in the workman; and does not even make an even an efficient workman. This is from Charles A. Bennett's History of Manual and Industrial Education, 1870-1917, an excellent resource for anyone willing to make the argument that real hands-on activities still belong in American education. Sense of agency is the perception that we have a modicum of control in our lives... that we can take meaningful action to make changes and bring things into our power and under our direct control. It is an important sense that can forestall anxiety and depression. "The concept of agency implies an active organism, one who desires, makes plans, and carries out actions." As we put more and more entertainment boxes in the hands of our children we can wonder if they will ever have a sense of agency with regard to the real world, of if the virtual one, that is so entertaining will be enough. If you wonder how to find such a sense, you can begin by taking a straight shaving off a plank. Hold a real tool in your hand and regain a sense of your own power. It is widely known that children who begin speaking more than one language at a very early age develop fluency with greater ease than those who must struggle later on. It is like there are windows of development that are closed after a child reaches a more advanced age. I began studying Swedish a few years ago, and it is hard to get an older brain fluid enough to comprehend things that would be so easy for a kid to pick up with no effort at all. The same is true of other things. For instance if a young woman was interested in dance, the time to start would be in Kindergarten or before. For hockey? The same rule applies. The same is true of the hand. A hand left altogether untrained in the manipulation of objects and tools would have greater difficulties developing skills later. You can see this in how quickly and effortlessly children have adapted to text messaging. But are all those millions of small fingers tapping their trillion of taps on tiny hand held digital devices exercising the full range of manual intelligence? We know that there are developmental windows for so many things. What about turning those windows into doors through which children might pass toward more meaningful lives? What about giving a grip on some real tools for a change? Mario sent the cartoon shown above which seems to fit the theme of this post. Today the first, 2nd and third grade students at the Clear Spring School worked to finish their abacuses and decided to host a wisdom of the hands project at this year's harvest party. Howard Schultz is the CEO of Starbucks, and as Joe Nocera writes in the New York Times,We Can All Become Job Creators. Howard Schultz's first big idea was that we should withhold all political contributions until politicians in America start acting like they care about more than their own political ambitions. Fat chance. The corporations and the wealthy will keep the money flowing to keep their positions secure in the American political arena. So that didn't happen. Along comes Howard Schultz with his second big idea, and this one might work. We Can All Become Job Creators. The smallest businesses in America, even the ones that haven't been started yet, have the greatest potential for putting Americans to work, but nearly any new enterprise requires capital and the banks aren't lending. So where can that money come from? Howard Schultz gathered a select team of executives from Starbucks and asked them to hlep him come up with ways to put the US back to work. What they developed is a strategy in which the millions of customers at their stores can invest in new American jobs. The idea is based on some of the same trickle up strategies that Starbucks has used in developing nations. It is worth reading. In fact, if you are near a Starbucks in your own town, you can partake in American job growth and renewal at the same time you get your morning buzz. Starbucks expects the plan raise $350,000 million in investment capital for new businesses. If Starbucks can do that, just imagine what other American industries might do if they decided to work together on the problem of unemployment. Development of new ideas in the economy always follow a path parallel to that of learning, from the concrete to the abstract. While some may think of the rich as residing in ivory towers and thus coming up with the ideas that spark innovation, the real work comes when people are engaged in reality and feel greater need for creative attainment. It is why kids in schools need to be doing real things.Each thing they know how to do is an important resource for creative metaphor and real development. This afternoon, the 7th, 8th and 9th grade students at CSS will be practicing on the lathe. This morning the 4th, 5th and 6th grade students at Clear Spring School finished the stamp dispenser trucks they have been making as a fund raiser for school travel. 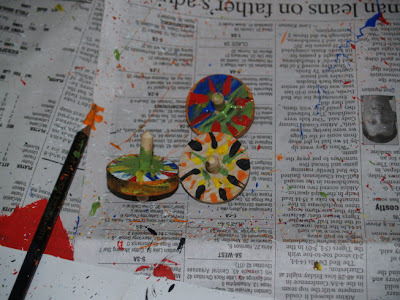 When the work was done, we made tops using spin paints. You put a dab of paint on the top and give it a quick spin to see what you get. In the high school classes this afternoon, Easton was the first to get four corners dovetailed to make a box. Other students practiced wood turning and other projects of interest and I have been applying Danish oil to the products I made last week in my wood shop. I took a couple boxes to school this last week to show the students what they can do with dovetails... I told them that they were free to handle the boxes, but then as I watched them slide the boxes around on the top of the workbench I had to remind them that the boxes were hand-made by a real human being and should be handled with care. 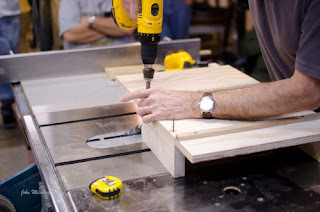 Handling with care does not mean sliding them around on the top of the work bench where they hammer and glue. So I see one more small bit of evidence of what we are doing to our children. I want children to have some regard for the objects in their lives. Even the things that were made largely by machine were made with some investment of human care. Most of the things that inhabit our children's lives and garner their avid attention are designed to last no longer than the next iteration of the device. That cycle from manufacturer to hand to landfill is designed to move as quickly as possible to maintain the economy and the economic interests of our manufacturers. But we pay a steep price. What about reverence? What about care, and what about respect? Are these things no longer necessary in our relationship with the objects that we are allowed to touch, and should children be taught to show respect? It seems children are no longer exposed to things that are hand-made unless they are behind ropes or glass in museums where the objects are safe from hands untrained in care, reverence and respect. And since they also have not been blessed with being makers and of knowing what it means to create useful beauty, our objects are at risk throughout American culture. But there is another side to things. When we slow down to care for something, there are profound changes taking place inside. I am reminded of a visit with Father Richard Clark when I was at his church to talk about building new altar furnishings. We walked through a passageway at the rear of the church that held sacred things. Even without others present to observe his behavior, his expression reverence in the presence of these things was immediate and sincere. If we learn to treat objects with care, do we not also learn to care more deeply for ourselves and for each other? By failing to engage our children in making useful beauty, and failing to teach them in the care of beautiful things, I suspect we do great damage to them and our human culture at the same time. On the very same subject, the November issue of American Craft has an article that I'm certain my readers will enjoy. Restoration Values is about a small team of craftsmen in Austin, Texas building exquisitely crafted small homes they call "bungalitos". It is unusual to find articles about the building trades in American Craft so I was pleased. Founded by John Hindman Red River Restorations grew out of a need to make doors and windows to fit houses needing restoration. 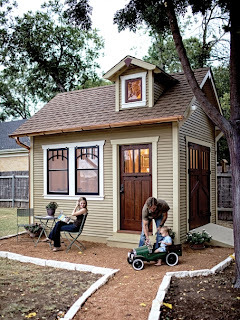 Old houses remind us that there's another way to live. "Our society has changed a lot in the past 100 years," he says, pausing. " ‘A lot' is too small of a [phrase] for how much it's changed." A culture of cheap and fast has crowded out values like quality, durability, and craftsmanship. And it's those values that Hindman is out to restore, one building at a time. but today, they are required to do a finer job. “You think it’s mostly masculinity and hard work that gets the job done, but it’s really more about finesse,” he added. Shannon is a woodworker. There is a rule that I remember from my undergraduate days in political science. No political system can rule without the consent of the governed. That means that you can rule most of the people most of the time if you can muster enough resources against them to force consent. It is best when governments earn consent. Unfortunately ours has not been performing that way lately. I'm not mocking and I'm not joking, but perfectly serious. Today I am staging a sympathetic work-in occupying my wood shop in complete sympathy with the occupy Wall Street movement. At some point in our past, our nation made the decision that banking and stock manipulation were more important than actual productivity. We set up our schools to bore most students and leave them creatively disengaged. Our nation's financial meltdown left millions out of work and without resources. Lobbyists and big money interests took control of the government. Many representatives of the financial and political aristocracies characterize the Occupy Wall Street participants as a mob, but they miss the point. They fail to see that there is a productive urge, and a physical and psychological imperative that we be enabled to feel power in our own lives, in our own hands, and that healthy human beings in a democratic society will not accept complete control by a monetary oligarchy. The Federal Reserve System and the government bailed out the banks and neglected to bail out the people, did nothing to restore them to creative, productive lives, and this is what we get. The results could be explained by poli-sci 101 but these guys are completely out of touch. I have great sympathy for the occupiers and the movement as it has spread. The US government is in the hands of a very small, very rich financial elite that manipulates the voter to get their stooges in office, and then bribes their proxies with campaign donations to keep them in line. It is pleasant and rewarding on the first cold day of fall to be in a wood shop. I'll be sanding, finishing things that I can sell to reinforce family finances, and American economy. Sanding is a seemingly mindless task. It is meditative as my hands pass objects through carefully choreographed sequential steps. My mind to wanders toward concern for our nation. Much of what we have witnessed is the result of a disconnect between the hand and mind. We allowed a two-tiered educational system and watched as they killed the woodshops and the arts in most schools. We allowed a financial elite to be trained to have little respect for the intellectual capacity required to make beautiful useful things. We have allowed a two-tier societal structure that assures a sense of entitlement within a monetary aristocracy who push aside common human values. Today I occupy my wood shop in complete sympathy with OWS. As there is no one here to try to throw me out of my own wood shop the level of courage required is not the same. Craftsmanship is more of a Cal Ripkin kind of heroics. We show up each day and try to try to put people out at 2nd or 3rd base. Wouldn’t it be better if we put people to work? And prepared them to be creative and productive in their own lives? It is a challenge. We need to fix schools, we need to fix banks and we need to live democratically. And that means there are a few bums that need to be thrown out. This morning I will be shipping small boxes and then sanding all the things I made yesterday. It will be a busy day in the wood shop. Working on some of the small things I make can be fun. There is a rhythm to it and a full integration of left and right hands. A state of flow ensues. I feel like I'm in the groove. And this can happen in so many things beyond the wood shop. Just think of working in the garden or in the kitchen as examples. Just think of chopping with a sharp knife. We are taught to think of ourselves as being either left or right handed, but the truth is that the two hands are a system for handling materials and tools. While the left hand holds the stock, or positions the stock, the right hand directs the tool. And so being dexterous, requires being useful, skillful and attentive in both hands, not one alone. If you are curious about this, try writing without having your other hand securing the paper. When I worked my few days in manufacturing so many years ago, my efficiency which was noted by the "efficiency expert" timing my work (complete with stopwatch and clipboard) came from having both hands in motion. As my right positioned the piece of steel on the machine, my left was waiting its turn to remove the stock when in the next instant, the right would be reaching for more as the machine came down to form the part. I use the same efficiency of motion in the wood shop, integrating left and right in the making of small things, and if I were exclusively left or right handed, I would be incapable of efficiency. And so it is rather crazy that we have become so obsessed over being left or right handed. The same applies to the brain. We talk about being left brained or right brained, whereas in reality, unless we have had surgery permanently dividing the two hemispheres, we are single organisms with tasks of holding and acting designated to the two halves. You might enjoy this earlier blog post whole not sum of parts that will help to explain it. If you look at the brain from an evolutionary standpoint, we might as well start out being bird brained, and it is not as bad as you might think. From a bird brain perspective, as described by Iain McGilchrist in Master and His Emissary, the left brain would be looking for seed in a field of sand while the right brain would be sensing the world for predators, friends and foe, and each form of attention, that of the left and right, is essential for survival. Imagine one side of the brain holding the world and sensing one's position in it as the other writes, shapes or slices. I think you can maybe see that parallel. It should not be any special surprise that what we see in our hands is mirrored in what we discover of the brain. On a slightly different subject video gamers are beginning to discover fitness as described in this article on CNN, Why gamers are a great fit at the gym. "In video games, you're constantly getting information about your achievements and (learning) how to do things better, "there's an opportunity to develop a mastery that's very much a key motivator." That translates well to fitness, where tracking your accomplishments enables you to progress quicker. You know you've improved when you run an extra mile or dead lift another 50 pounds. People like to know they have control over their future. In video games, you can choose your path, the skills you want to improve, even your outfit. Making the same choices in your fitness regimen helps you feel empowered. "Games make the goals really clear... You have to run from point A to point B, deliver a message, kill this bad guy. You have a very clear sense of 'If I just do these steps, I will succeed.' And let's call them quests because it sounds heroic. And who doesn't want to feel like a hero?" It is ironic that they don't see the same things at work when we take a piece of wood and shape it into something useful and beautiful. There is a sense of the heroic when in the face of mindless consumerism, you become a craftsman and a maker of useful beauty. My work from the last three days is shown in the photo above. Still to come? Sanding and application of finish. Last night I finally had an extended conversation with Professor Alex Slocum of MIT. I had heard him speak briefly about the hands at the Furniture Society Conference the summer before last and we'd been in contact via email in hopes of a chat. You can learn a bit about him from this site. The photo shows him explaining a method for storing energy on the seafloor to President Obama. Professor Slocum is working with others on a variety of ways to get kids thinking with their hands. One is a tool similar to Facebook that would allow students to share what they are really doing not just what they like. Of particular note in our conversation, Slocum said that if he had a trillion dollars and a decade to do it, and an American president to go a long in support, he would put wood shops/ making laboratories in every school in America. 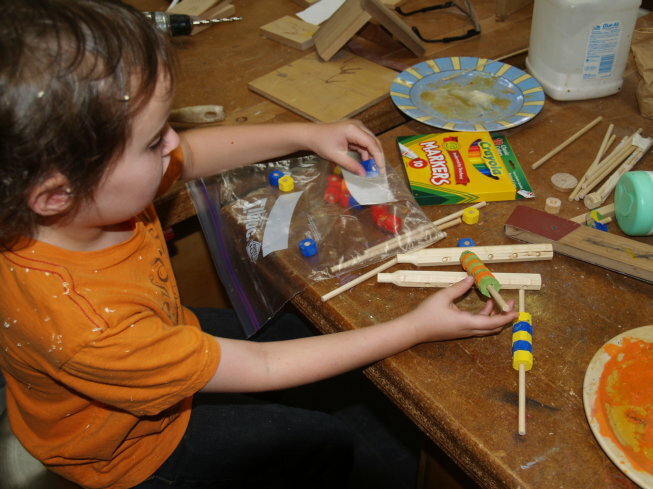 He noted that kids need to be breaking things to learn how these things work at their most basic levels. Professor Slocum and I tend to see many things eye to eye. He sees the use of the hands as a biological imperative. From birth we are predisposed to engage the world primarily through our hands. We may witness the world through eyes or ears, but engage is the word that matters, for we are not here just to witness but to engage and survive. Perhaps a psychologist would see the hands as a necessary psychic compulsion. From a more general perspective, more metaphorical, and more poetic I see the hands as "touching" every facet of human existence, from the way we think, to the ways we talk, to the ways we understand the universe and each other. And as each of us becomes more watchful and cognizant of the role our hand play in our lives, we may each become more astounded at how they shape our lives. But what the heck are we touching, and what are we using the hands to explore? Shall we launch their explorations toward the fundamental biological, physical and cultural landscape, or narrow their exploration to the serial iterations of consumer devices that are designed to monopolize their attentions with illusions of creativity? It is a question we need to ask. For thousands of generations, human scientific understanding was based on observations that took place in our physical manipulations of material through the making of beautiful and useful objects. Thus it can be stated without reservation, that the hands provided the foundation of human life and understanding. Professor Slocum suggested that children need to break things. They should be taught to have no reverence for the box the electrons came in. He notes that the same rules apply to both wood and to code. Children need to be allowed and encouraged to take things apart without hesitation, to learn how things are made and what makes them work. This morning and afternoon I will be working with the CSS first, second and third grade students to make abacuses. Simple ones appropriate to their age group, that will allow addition and subtraction, and be fun to make and engage the hands and fingers in counting. 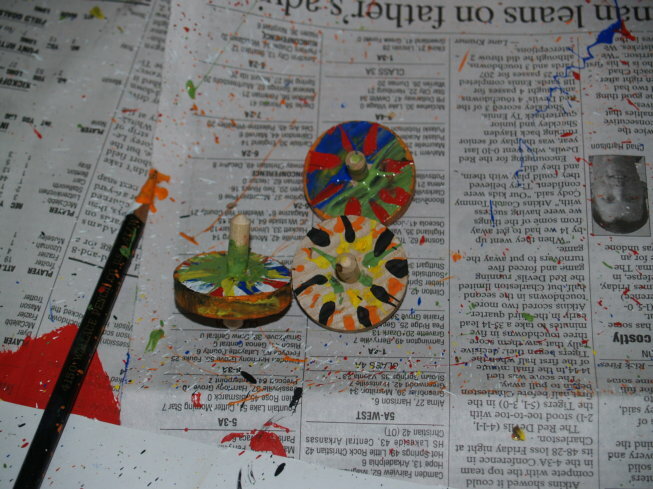 First we are making the colored beads, so that means drilling and painting. Next week we will made the frames and assemble them. 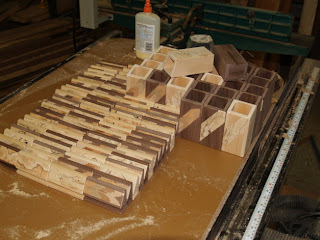 In my own work shop I received a large order for boxes, taking more than what I have in my inventory. I should be working in larger volumes, but I also love a sense of urgency in my friendly competition with the Chinese. This order will go out on Friday, and already in my woodshop, I am making replacements for the objects shipped and to fill the second part of the order and restore my inventory to its previous level. I got an email from Brent in East Tennessee, a teacher who is planning to retire soon to spend more time in his wood shop. He asked about insurance and liability issues as in his state, the high cost of insurance is claimed to be the reason for the close of woodshops and the refusal to allow woodworking in schools. Nuts. Woodworking with proper supervision is less dangerous than basketball, and far less injurious than football. And more instructive. Please, when school administrators give you this kind of runaround, please ask to see the quotes for their insurance premiums, with and without woodworking included. When the powers that be decided that we need not be a manufacturing nation, they proposed that we would send every kid to college and no longer need woodshops. We can see how that is working out, can't we? We have fallen behind other developed countries in our children's education and China is beating the pants off the US in research and development spending and graduation of new engineers. The truth is that every child needs the opportunity to learn from the real reality of hands-on learning(even those going to college). Every child needs the opportunity to discover creating something useful and beautiful through the eyes of their own hands. Today in the CSS woodshop, John was turning a piece of cherry. He made a smooth tapered cylinder and then sanded it to near perfection. Then he applied wax, and after polishing it was certain that he had never felt anything so smooth in his whole life. "The schools have dropped the ball when it comes to teaching. I think your ideas about working with your hands and creating something has a much deeper and life lasting effect on anyone who ever has that chance. This past year, my son was taking an Art History class and was totally bored and frustrated that he had to sit and watch slides and listen to a teacher who simply read from the text or remembered what her teacher had read from the text. "In a meeting I had with her I told her of a couple teachers who I thought were the best Art teachers and how they had brought the art to the students by having the students make art and incorporate the creativity into the history. Sadly she said she had her way of teaching and had not had a problem with the administration about her performance. A hands-on approach would, I think work wonders with many disciplines in the educational field. After all isn't that what we all do, when we leave academia, join the unwashed and have to learn how to finally do something in order to survive? How fortunate are we to have found something to keep our minds and hands busy for so long and been able to feed our families and thrive. "I think it's time to build a pottery shop in the barn and get back to teaching a few kids including my own how much fun it is and how simple it is to make something useful from the earth....the most useful thing being the doing itself!" George had been a university professor for a few years before pursuing his sculpture career full time. So, what else can I say? The hands-free notion is a plague on all of American education. We can fill lecture halls with students checking their status on face book and the Universities can be paid trillions of dollars for it. The school administrations are happy with how things are working for them... but we have kids in the street protesting Wall Street because there are no jobs. Wouldn't it be better for all if they had been taught to actually do something? And thus lessen our dependence on the ignoramuses of Wall Street who despite being given trillions in bailout money can offer no solutions to the American economic dilemma but to continue to pay exorbitant bonuses to their executives? But children are drawn to the heroic. Just as my friend George is drawn to heroic themes in his work, we each need the opportunity to identify with things greater than ourselves. To fall into a tradition of crafts can offer those heroic opportunities as we give things at hand our very best, our greatest care and deepest attention. Make, fix and create... The future of our nation lies in your hands, not theirs. 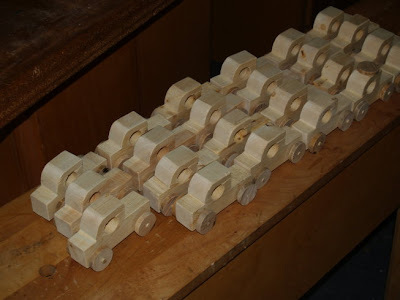 This morning I will worked with the 4th, 5th and 6th grade students at Clear Spring School in an assembly line making stamp trucks to illustrate a bit of economics. They will sell the desk top toys to raise money for school travel. This afternoon I had box making wood available for students ready to begin cutting dovetails for box sides. I allowed some to take a break from box making by turning on the lathe as shown below. There is a thing that happens in the naming and identification of things. You observe a bird in the back yard, and you say to yourself, "tufted-titmouse," and you gain a sense of satisfaction in your own knowledge and mastery of information. But the ability to name the bird differs from the ability to fly. There is a great deal more going on in the bird than is revealed by the identification and naming of its external form. The naming and identification is either a stopping point, or the point from which greater and deeper analysis and understanding can ensue. For most, the naming is the end of knowledge rather than its beginning. Many art history courses in universities are designed to impart a sense of intellectual mastery of the arts, so that from an academic perspective the student can feel a sense of ownership of the subject without ever being required to handle a tool or a brush. Too often education stops at the neck. You see it, you hear it, you process it in the brain, and you recite the common concepts, and the discussions of those who have devoted their lives to the critique, classification and analysis of great works allowing you to participate confidently in discussions while expressing a sense of mastery and superiority you do not have. Anyone wanting to look more deeply at the origins of academic dominance over the arts might want to read Barbara Maria Stafford's book, Artful Science. She can turn a phrase to challenge the best of academicians. A sincere look at the hands, and serious examination of what they can impart to learning at all levels could awaken us to much more. It would be very easy to read all this and assume that I have an anti-academic bias. The truth is that I have profound respect for academics, but I also know that they are enriched and brought to greater life when the hands take their place as full partners with the head and heart. Any questions? My arguments won't be enough. Pick up a knife and a stick. Invest your time and attention. A steady hand, sharp steel, and slender shavings express an understanding beyond words. See if something occurs to you. You might feel silly (and awkward) at first. Learning something new or reengaging something near forgotten can do that to you. It means you have stepped beyond your comfort zone. Those feelings are the sign of the heart breaking its common boundaries as learning begins to take flight. Do not allow yourself to be stopped at the naming and classification of things. Take learning into your own hands. Last night I had restless dreams. I was on a journey, and as you know great journeys are important to the soul. In this, I walked up a steep hill and was rewarded at the top by a field of snow. I could take nothing with me. No suitcase, no change of clothes. Where I was going I did not know except that I had a sense of the great urgency and importance of the journey. I am working these days on trying to get my Wisdom of the Hands book developed enough to go into the hands of an agent. I am being helped in this journey by my former editor from Woodwork Magazine. We are walking through the snow. One thing that I can see so clearly is that I am best at writing short things. Articles, not books, essays, not chapters. I look through the blog and find interesting things that I have written, and I am thankful for this gift. Whether or not the Wisdom of the Hands ever becomes the book that I have imagined, as I look out over a field of snow, I know that this journey that we share is the journey of a lifetime. We must be seized by great notions. "We kind of lost the focus in our middle schools on what middle schools are all about..." "What we have largely done is (we've) taught to a test... At first I thought it was going to be helpful -- the test was -- it was going to focus on student achievement and it was going to help all of our kids. But what it has really done is narrowed our curriculum and it's narrowed our focus, and we've lost sight of what is really important, which is getting our kids ready for high school and teaching them critical thinking skills." One of the things they've done to make things better is to throw out much of the pre-packaged commercially produced curriculum they'd spent way too much money on and are going "naked," allowing teachers to do what they had been taught to do in the first place. Teachers, students and administrators must all be seized with greater notions. It may seem like walking in a field of snow. And the students will be better for it. The evidence on the topic is pretty clear. The United States is slipping by most measures of global competitiveness. In category after category - actual venture capital funding, research and development - America has dropped well behind countries like Japan, South Korea and Sweden. We had already slipped way behind those same countries in education. Do YOU see a correlation? If not, we will send you back to logic and math 101. Allow yourself to be seized by something great and noble from within. It is difficult to get a business loan in America these days. But during the bailout of American banks, the Federal Reserve passed out 16 trillion dollars in essentially free no-interest loans to the largest banks in the United States. This was documented in the GAO report in July, but few seem to be talking about it as yet. The money essentially covers banking losses resulting from malfeasance, poor planning, and stupidity. If the Obama administration and the Federal Reserve had instead loaned an equal amount of $50,000 to every man, woman and child in America, our economy would not be in the desperate situation we now find ourselves in. The question becomes, "what would you have done with $50,000 if the loan had been made directly to you? Remember that the loans to the banks were at near zero percent interest. Of course giving $50,000 to each and every American would have so completely devalued the American dollar that we might have been running around with wheelbarrows instead of wallets, so to just shove cash into every American pocket would not have been the best of solutions, but giving 16 trillion in loans to the banks was no solution either as we have seen. It just allowed the banks to continue paying exorbitant CEO salaries and bonuses and carry on their new business as usual... taking away homes through foreclosure and pushing more of the middle class into poverty. I have been an admirer of the Occupy Wall Street movement. It amounts to a bunch of people of all ages informing our culture that there are values greater than money. The movement may be an inconvenience to police and business as usual on Wall Street and in other cities. The mayor of New York may not like it a bit. But it may be time for the Federal reserve to call in the massive loans it made to the banks and find better means to actually make loans to the American people... that we may start new businesses, small farms, local operations that employ people and put them to work rebuilding the American dream and our own prospects for prosperity. We know that is not likely to happen. We will have to take creative matters into our own hands. This afternoon my wife and I went to a food fair sponsored by Carroll County Fresh. We bought fresh produce, visited with friends and celebrated a return of local agriculture. One couple we visited with is making their living on 1/7 of an acre of land, which shows what hard work and a bit of land can do when used wisely. C.V. Kirby taught carving, modeling and design at the Denver Manual Training High School in 1902. Today I am working and writing on other things. The point is that economic decline is not always a bad thing. If we are led by circumstances to be creative, imaginative, productive, contributory of real value to the lives of others, the economy may suffer, but the character and culture of our communities and the quality of our lives will not. The things that are of the greatest value cannot be measured. And so whether we are talking about economy or education, there are matters that transcend in importance the most prevalent view of things. Bring water to boil, add dry ingredients and stir. Play-doh was first introduced as a wall paper cleaning product and then long after its first use, company executives learned that it was being used as a modelling clay in schools. That discovery in the 1950's launched its marketing as one of the top children's toys of all time. But it is one you can make yourself. My mother's recipe is not the same formula, but works as well and was once in wide use by primary school teachers all across the US before No Child Left Behind legislation and before all teachers were under such pressures from standardized testing. Yesterday I went to Withrow Springs State Park to whittle with the CSS kids, go for a hike, have dinner and watch "Paper Bag Dramatics" which is a tradition at every CSS camping trip. The idea is this. Each patrol group is given a bag full of costumes and props and compose their own dramatic presentation to share with the other campers. Each patrol group is composed of students from grades 1 through 6 and you can imagine the performances all go astray. The first and second graders all seem willing to steal the show. 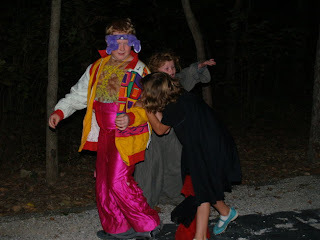 Normally shy children break free from their own inhibitions when given a costume and the opportunity to entertain. Add to the drama the fact that paper bag dramatics is the last hurrah before roasted marshmallows and getting ready for bed. That means that the performances are held by flashlight and under the headlights of the nearest vehicle, and you can see that each performance is unpredictable and unique. They all devolve into near pandemonium, and so they are an absolute favorite camping activity. One would hope that educators would all see the value in such things, but we have become a society focused on an educational bottom line. Read, write, cipher. To heck with the rest. Today we celebrate the life and mourn the passing of one of the world's favorite and greatest college drop outs, Steve Jobs. I have had a mac computer since my purchase of a mac Classic in 1991, and this is being written on my iMac. We human beings have always been connected with each other in such profound ways and the computer has made these connections far more apparent. Steve Jobs is alive still within this keyboard, and in the continued connection you and I have with each other. Craft In America has a new segment premiering in October that makes the connection between families and creativity. Just as computer gaming has now become a common family activity with children, creative engagement of the hands once was. The difference is that one of these likely leads to something and the other not likely. The Craft in America Family Episode will air on PBS October 17, so we are in range for you to put this on your viewing calendar. The episode will include four families who are wood turners, potters, glass blowers and the makers of cowboy boots. Of particular interest to woodworkers in this episode, President Jimmie Carter shares stories of learning woodturning techniques from Ed Moulthrop, father and grandfather to a dynasty of woodturners, and considered by many to be "the father of modern woodturning." As the son of a Kindergarten teacher, who was herself the daughter of an Iowa farmer, the inclination for hands-on learning and creativity was always present in our home. It tends to run in families. And for that I am eternally grateful. The curious thing is that we for the first time, live in an age in which we can choose not to do those things that the hands within families have always done. We need not cook. We need not sew. We need not fix. We need not plant, nor harvest, nor tend, nor nourish. We need make neither things nor music to share with others. Nor need we take the traditional pleasures in these things. We can play computer games in our parents' basement apartments until they die and we are evicted and thrown into the streets. Share creativity within your own family. The quality of your children's lives depends upon it. 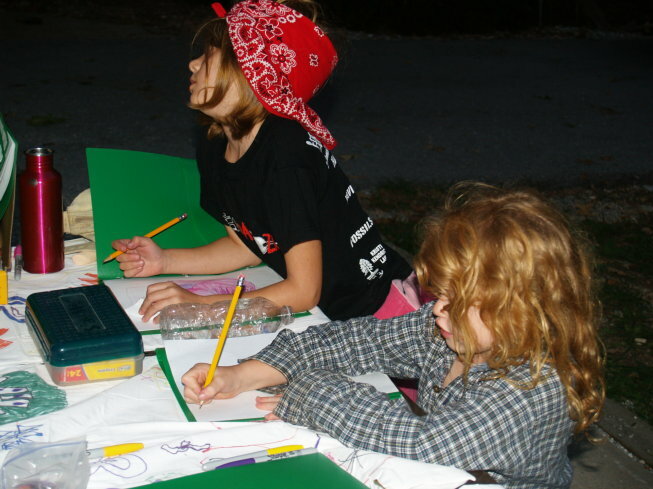 The CSS students, grades 1 through 6 and 7 through 9 will be camping tonight on the annual Clear Spring School fall campout. I will be joining the students grades 1-6 for whittling and a hike, so this morning I am preparing basswood for spoon carving. Does college prepare for teaching? I have heard many times from teacher friends that the reality of teaching is not at all what they were prepared for in college. And so I wondered if this question had been addressed on the internet. Check out these links. The first is more general for all occupations and the second is more specific for teacher prep. How does college prepare you for the working world? and this How well did your preservice program prepare you for the classroom? The general answer of the first question from respondents on Yahoo is "it doesn't". According to the eudutopia poll in the second link 81% of new teachers found themselves to be less than well prepared for the classroom. One teacher, Andrew Packard, wrote a long comment in response to the edutopia poll entitled How My College Didn't Teach Me! It's worth reading. According to Mr. Packard, "Three practicums, Student Teaching, and a Seminar" came last in his university experience. He notes: "This is where you find out teaching is HARD and real hard if your college doesn't properly prepare you!" Wouldn't those lessons be better to learn earlier in one's college experience? According to the Theory of Educational Sloyd, move gradually from the easy to the more difficult. But I'm of the mind that in some things you really don't want to save all the hard stuff for last. Otto Salomon, co-creator of Educational Sloyd also maintained that learning should move from the concrete to the abstract and you can see that failing to make concrete connections between classroom learning and the reality of teaching is a huge problem in teacher education. In backwards fashion we force the students to dwell on abstractions, and then throw them against an unyielding wall of concrete. 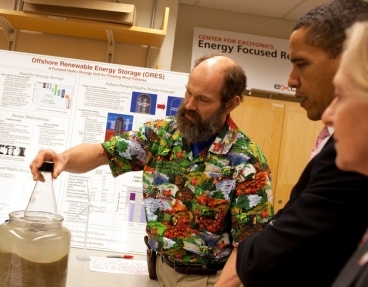 The thing we could learn from this is that even college students are hands-on learners. To sit idle in lecture halls (while checking their facebook pages) is not where real learning takes place. As impractical as it may seem to the present day flock of highly credentialed academicians, students desiring to teach should be given responsibility in the classroom from day one, to learn from real experience as teachers. We do our students and prospective teachers a tremendous disservice in our present arrangement. In a dystopian bargain students get new credentialed teachers poorly prepared to teach, and 50% of new teachers leave the field in the first 3-5 years after having made significant investments of time and money in their college educations. The combined effect is a constant introduction of inexperienced and poorly prepared teaching staff. Oops. Or perhaps a stronger expletive would be more appropriate. 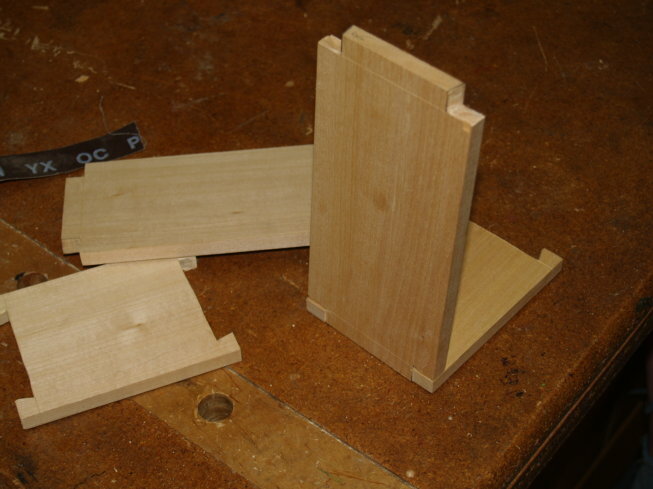 Today the 7th, 8th, and 9th grade students at CSS will continue practicing dovetails. The photo at left showing Time writer and blogger Lev Grossman's daughter gaming on her laptop shows how easy it can be to come to the right conclusion while giving the wrong impression. Grossman is one of those young men who grew up on gaming and then couldn't wait to infect his own daughter with his addiction. Something made him wonder, however and he decided to consult an expert Susan Gregory Thomas whom he now calls Susie Joykiller, because she explained to him that his ideas of the wonderful advantages like hand/eye coordination he was offering his daughter were just his own destructive fantasies offered as rationalization. Then the magazine article pulls the plug on Grossman's discovery by offering websites for tiny gamers. A better thing would nave been to tell where to buy scissors. What this article illustrates is that we are now entering a second generation in which children have been turned over to machines to entertain them and instruct them while the age old tools of human creativity remain untouched. As people generally read only the first few lines of articles, most readers will be influenced by the picture of Lev Grossman's daughter gaming (Oh! So cute!) and never understand the stupidity of the idea nor the complexity of the issues involved. As the old saying goes, apples don't fall far from the tree. Parents, not knowing any better from their own upbringing have allowed their children to be disengaged from exploration in the real world and it shows. 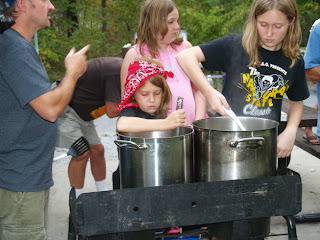 I got a request from a reader for an interview on how to get children involved in hands-on learning. What could be simpler than to do-it-yourself? Let's develop a remedial action plan. When I grew up, there were no video or computer games. I wandered the woods and fields with my pellet gun in search of game. My parents didn't have to make up stuff for me to do in the real world. I had my own imaginative inclinations for that. In the basement work shop, I had full access to a range of tools that allowed me to make things. Instead of sharing a love of gaming, my parents shared a love of making things and creative engagement. And so this problem of how to engage children in real things, hands-on learning is a matter we can fix. Take your children out of doors and leave the digital devices behind. Let them feel real world wind in their hair. Play soccer and other sports. Pitch the ball with them. Spend some time with them in the hardware store shopping for nuts, bolts, screws, tools and all those things that children really need to know about if they are to become the least bit creative. Put away the iPods and play music of your own making. Plant a garden. Fix a chair. Cook and clean and make them help. Take a trip beyond the limits of your technology. Supply the tiny tools that allow your children to go where no manufacturer wants them to go. Tear down the iPod and see what's inside. Flex your own curiosity, challenge them to flex theirs and let the chips fall where they may. Gaming is addictive and we must take time away from that crap if we want our children to become engineers, scientists, artists, musicians and more. There is an article in the National Geographic this month about the development of the adolescent brain... why teens do what seem to be stupid, crazy things, and it is obvious that not all of us are wired exactly alike, and not all develop at exactly the same pace. We ought to notice this a bit earlier. For example, some children begin walking as early as 7 or 8 months, and some begin as late as a year or more, and where a child lies in that window of development means almost nothing relative to the child's long range development. But lay on a grid, and put a child into classes where children are all measured and expected to develop and mature at exactly the same pace, and you will have created severe limitations for some children, leading them to assume that they are not and will not be capable in certain areas. Math and reading are examples. We are now, in American Schools, pushing kindergarten students to read and as a result create children in which reading is a chore and task to be avoided rather than the pleasure of opening the whole world for their examination. Malcolm Gladwell, in his book the Outliers tells that most professional hockey players are born in the months between November and February, because at the time of enrollment in youth hockey programs by year in school, those students are the largest and most well developed, and have a clear advantage in early play. Once you are promoted or demoted based on ability and measured unfairly against peers, it seems the die is cast. But children are not clockwork, and schools have their ways of imposing as many limitations as can be imagined, in that instead of opening to children's unrestricted natural abilities, they run kids through like the developmental clockwork they truly are not. What is the answer? Remove standardized testing. Make schools and teachers more cognizant of the ranges of natural development. Make classes multi-year, thus allowing children who are struggling with a difficult subject greater time to get it at their own developmental pace and without being made to feel stupid. Promote late blooming. So how does all this relate to woodworking? To make something from wood is dependent on a confluence of developmental markers. Strength of hand and mind, as well as dexterity in both hand and mind. One must be able to conceptualize a series of interrelated steps toward a goal and focus clear attention on each step. But there are those who have come to the wrongful conclusion that hand work is mindless. It is not. I have begun using counting on fingers with students to help them to better remember and conceptualize the steps required for making wooden objects. This is using the part of their brains, the intraparietal sulcus, in which both counting and control of the fingers takes place. We are having profound effect in that students in the first second and third grades are remembering the steps without me having to repeat them individually for each student. Can you imagine how this same process could be applied in math? It takes only four steps to factor a quadratic equation and most math problems can be solved single-handedly. The way it works is this... When the first step is described, the student touches the little finger with his or her thumb. When the second step is described, the student touches the second finger. Proceeding on, when the student reaches step five, the thumb alone is held in the air. Using both hands up to 10 steps can be memorized and remembered. My first, second and third graders made it up to step 6 in making pinwheels last week with almost no repetition of instruction. American educators have claimed that our poor performance in the PISA studies is due to the poor who drag down scores in urban areas. A new study co-written by a professor from the University of Arkansas has found that even students in affluent suburbs are severely lagging behind schools in other developed countries like Finland, Norway and Japan. This study indicates that we can no longer blame urban non-white school children (or their teachers) for the failure of American schools to meet international standards. "Being from an affluent suburb, unfortunately, is not a guarantee of world-class performance," --Jay P. Greene, the 21st Century professor of education reform at UA. It is so curious that while we live in an age of rapid scientific advancement we also live in a world of profound self-selected and self-sustained ignorance. People have arrived at the conclusion that regardless of what happens, we are free to choose from a smorgasbord of beliefs that need not be compared to physical reality. So we have politicians and religious leaders who deny the existence of global warming. We have huge numbers of people who under slightly different educational and cultural circumstances might have had curiosity about the real world, but instead feel intimidated by science. This article in the New York Times, Temperature Rising: With Deaths of Forests, a Loss of Key Climate Protectors,discusses the dramatic effects of global warming on our nation's forests. This may seem to be unrelated to the loss of wood shops and other hands-on learning opportunities in our nation's schools. But you cannot successfully whittle a stick without being able to formulate investigatory hypotheses. Can you get it? There is an important interrelationship between crafts and scientific investigation. 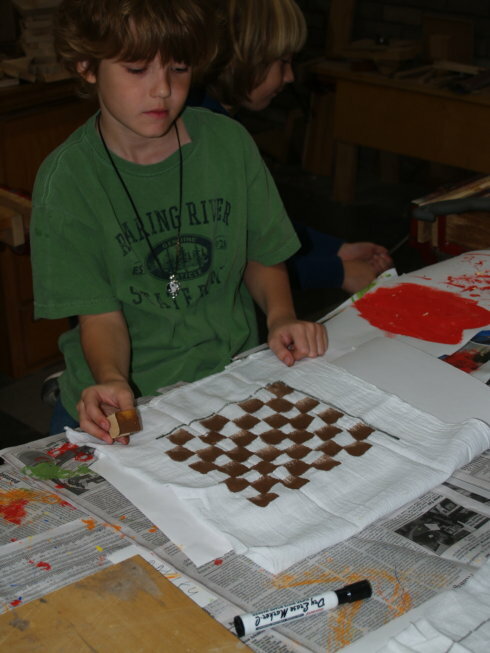 We move in learning from the concrete to the abstract, and early engagement in crafts forms an essential scaffold for the advancement of science in schools. I am particularly concerned about our nation's forests and their decline. I am a woodworker, concerned not only for the woods I use, but that they also be available for subsequent generations. I take this personally. I live in the hardwood forests of Northwest Arkansas and I am literally disgusted that pinheaded politicians would put what I love and where I live at such risk when we could be taking steps as a nation to address the causes of global warming.